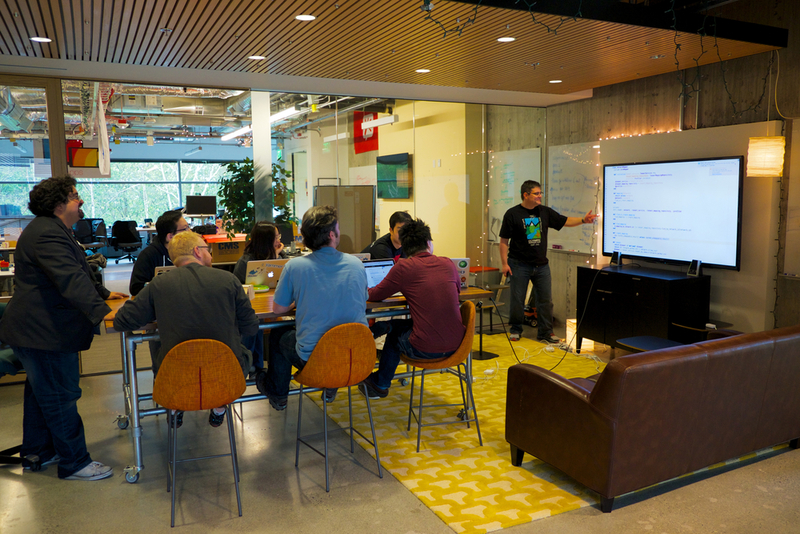 At Yammer, we work the way our product works: out in the open, by giving everyone a voice, and quickly. We value Transparency over reputation, Community over individual accomplishments, Empowerment over conformity, Humility over being right, and Impact over output. And we value each other most of all. Our job? To make everyone else's jobs better. To do this, we hire people who care about quality, then empower them to get things done. We're constantly looking to improve ourselves and our company. As our problems get bigger, we get better. Every feature we ship is another feature we can use to help us do our jobs. And help the world do theirs. The world is always changing. So are we. The people working on Yammer are great at what they do, but they’re also great people, period. When you work at Yammer, you get a chance to work with almost all your colleagues on a variety of project teams, spread across San Francisco and Redmond. On top of that, everybody gets the opportunity to be the technical lead of a project—nobody gets left out! We value the ability to learn and grow more than anything. Even if you’re not familiar with something, it’s not a big deal—one of your coworkers will be more than happy to help, or we’ll support your learning it another way. Want to learn from someone? Just ask and they’ll be more than happy to mentor you! Community is important to us, too. We’re always sponsoring or hosting a variety of different events, meet-ups, and talks. If you want to present your own talk at a conference, we can help you the entire way, from proofreading your proposal to having people cheer for you at the conference! And if there’s a group or conference that you strongly believe in, we can try to get involved. Behind every decision, every feature, and every line of code of Yammer is a crowd of women and men who have a wide variety of skills, experiences, and passions. We spend every work day together, figuring out how to make our product the best it can be. And we learn a lot in the meantime. And then, sometimes, we write about it. Yammer is made up of folks from different backgrounds, races, ethnicities, work histories, and life experiences, and we're eager to maintain and grow that diversity. After all, Yammer is used by all kinds of people, so that diversity of experiences is critical to how we develop. We believe in working sane hours, actually using our vacation time, learning on the job, and paid parental leave.